Dubai, UAE - 09 August 2018: With the summer holidays almost over, there’s just enough time to squeeze in some extra fun at Modhesh World, one of the region’s largest indoor entertainment and amusement facilities in the UAE, before heading back to school. Modhesh World will be celebrating the last few weeks of summer fun with cake, balloons and lots of prizes with the “Back to School” party, whilst still offering a wide range of activities to keep your kids engaged, active and learning through exciting activities. From 9 to 16 August, all children and families are invited to join the fun at Modhesh World and take part in the daily “Back to School” raffle draw, where everyone who spends AED 300 between 10am and 5pm can participate in the grand raffle to win amazing Jumbo Electronic prizes. Visitors can watch the raffle draw live every day as it takes place from 5pm to 6pm on the Dubai TV Modhesh World Program. Three lucky winners will be announced daily, with 24 big winners in total! Winners will have the opportunity to take home electronic prizes from Jumbo Electronics, making the “Back to School” party that much more fun. Modhesh World will run until 25 August and is organised by Dubai Festivals and Retail Establishment (DFRE), an agency of the Department of Tourism and Commerce Marketing (Dubai Tourism), and forms part of DFRE’s much awaited annual summer calendar of festivals and celebrations aimed at positioning Dubai as the summer destination of choice. Modhesh World is open daily from 10am to 11pm on weekdays and 10am to 12am on weekends. 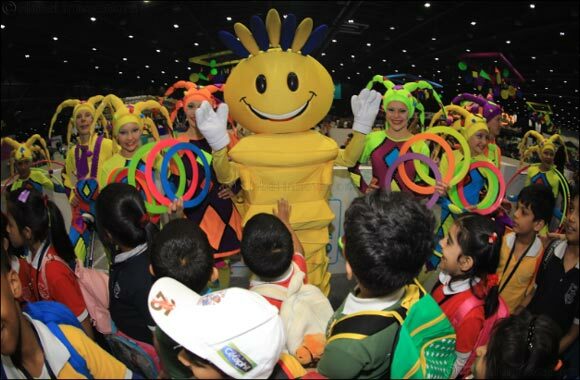 Modhesh World is held at Dubai World Trade Centre and is sponsored by the minimart Zoom and the fashion retailer Splash (part of the Landmark Group). Modhesh World has many partners including VLCC as the support partner, Just Play Multisports Camp as the official Holiday Camp partner, HTC as the official Virtual Reality gaming partner, and Gargash Motors as the official car partner.